Is There a Honolulu Zip Line? What if my child is underweight? Can we ride tandem? If a member of your party meets the age requirements, but not the weight requirements, they may still be able to participate. They would ride tandem with another lightweight sibling. When you make your reservation, please inform us of any lighter participants in your party so we can make arrangements. 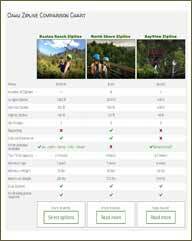 What is the minimum age to zipline?